French country kitchens embody the beauty and character of rural France. With natural materials and earth tones foremost in the color palette, a country French kitchen design creates the perfect environment for comfortable living and authentic cooking. This warm country French kitchen contains ornate wood carvings, rustic ceiling beams, wrought iron lighting, and Old World charm. Setting the Mood: Sometimes rustic and often cozy, country French kitchens have a timeless and natural appearance. Wide-planked wood floors, antique brass hardware, stoneware, terracotta, wrought iron, fabric, and copper all contribute to the authentic atmosphere of the French country lifestyle. Inspired by the French Countryside: With a close bond to the outdoors and rural life, country French kitchens derive their colors, decor, and ambiance from the charm and beauty of the French countryside. Lavender fields at sunset, an autumn vineyard in Alsace, a hillside village in Provence, rustic farmhouses in Colmar, and verdant hills in Perigord each lend inspiration to varied elements in the kitchen. Decorating Ideas: Kitchens in the French country style tend to celebrate culinary equipment, not hide it away. Cooking utensils, pots, and pans are often displayed for both visual appeal and easy access. These can be hung on the hearth or on a hanging pot rack over the kitchen island. Enliven the decor with fabrics, flowers, fruit, bread, and wine out on display in baskets, open shelves, or on the countertop. Completing the Look: Try dressing up your country French kitchen cabinets with leaded glass or wire grille door panel inserts, adding some lights to illuminate the cabinetry from within. For an authentic look, paint walls, cabinets, and paneling with Impressionistic colors including lavender, cobalt blue, and antique white. In lieu of glossy polished countertops, consider using honed granite or marble which has a more earthy satin appearance. Photo Gallery: Below are some pictures of kitchens in the French country style. If you enjoy the character and beauty of these kitchens, you may want to take a look at the galleries of country, cottage, rustic, and Tuscan kitchens as well. Enjoy the photos! 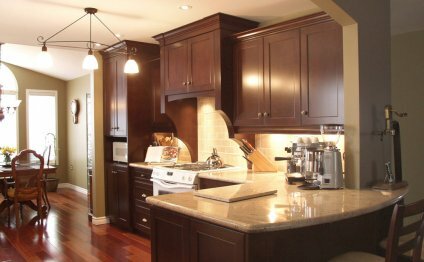 More Kitchen Styles: Return from French Country Kitchens to Kitchen Cabinet Styles for more design ideas and inspiration.